Following the announcement of its Apple Card, Apple has now altered its existing Apple Pay Cash service. As of March 25, Apple Pay Cash ceased allowing users to make person to person payments using a credit card, although it still supports ACH bank transfers. 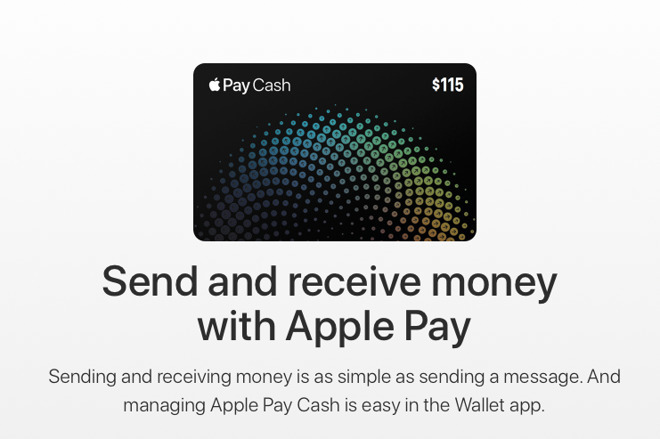 Apple has now also added an Instant Transfer option which lets you transfer money from Apple Pay Cash to an eligible debit debit card, but for a 1 percent fee. Apple says that these changes to Apple Pay Cash are coming with the updates to iOS 12.2 and watchOS 5.2. Apple and Green Dot, the service that Apple uses for Apple Pay Cash, claim that dropping credit card support is to help customers, by avoiding cash advance fees that a bank may pass on to a customer when paying an individual with Apple Pay Cash. Apple's announcement says that the Apple Pay Cash Instant Transfer service usually works "within minutes of your request, but could take up to 30 minutes." While Apple now charges for transferring money out of Apple Pay Cash and no longer supports credit cards for person to person transfers, it does still support debit cards without charge. "You can continue to send money for free with Apple Pay, with no fees at all, using your debit card or your Apple Pay Cash balance," the terms clearly say. Apple Card was announced at Apple's March 25 event and will be launched in the US this summer. Goldman Sachs CEO Richard Gnodde said that the Apple Card will see an international release, after an initial, focused deployment in the U.S.